8FOOTSIX: "It is much more important to be oneself than anything else"
"It is much more important to be oneself than anything else"
Order a copy right now and open it the evening that it arrives on your doorstep. Better yet, here is a free ecopy so you can start reading tonight. 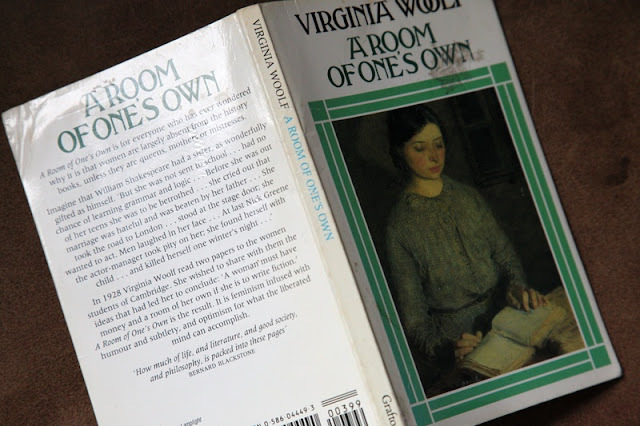 I take for granted the privilege of education, a career, the right to vote, the ability to own property, great pants....Virginia Woolf's A Room Of One's Own reminded me how far we have come in the last 100 years or so. A Room Of One's Own is a witty and intelligent take on women in fiction. Virginia Woolf discusses many of the great authors who came before her (making you want to pull Jane Austen and Charlotte Bronte off the shelf again), then goes on to encourage woman to write. Of course, I couldn't help but wonder, what would she think of bloggers? Everyday, women are writing. Bloggers are uncovering their authentic voice. After reading A Room Of One's Own, I want to live up to the promise she sees in me (although there is no great genius here). I will continue to read everything I can get my hands on, learn how to form a proper sentence*, and "be truthful, ... the result is bound to be interesting"
Please, pick up a copy of this book. I would love to know what you think. *I need to take a writing class. I ask myself, what would VW think of 8footsix? Perhaps for a little while, I might write as if she is in the audience. Of course, my punctuation, vocabulary and grammar won't improve without some work! ps. This is not a formal book review, just part of the impression it left on me. I still have many questions. I want learn more about how women might be influencing contemporary society. I want to know what has changed/is changing as a result of women having equal status to men. There is a whole feminist discussion going on out there that I am suddenly curious to listen in on. pps. I underlined this book as I was reading because I want to go back and review her exact words and phrases. One quote stands out: "It is much more important to be oneself than anything else". Such a wonderfully written book. ppps.I plan on reading To The Lighthouse next. I am envious of english lit majors who read these books in their early twenties! pppps. I also want the poster! Thanks for the tip! I must admit, I've always been somewhat afraid of Virginia Woolf...intimidated is perhaps more accurate.. Must check it out! Seriously, she is brilliant. I am not the first to discover this, but I am so glad I found her! I think I'm going to have to download this book asap! My problem is that there are SO MANY books I want to read! This was one of the most influential books I've ever read in my life! This one is really more of an essay...You can read it in a few days! This is one of my favourite pieces of writing. I always imagine the scene...Woolf speaking to these young women, who weren't even allowed in some parts of Cambridge University, the privilege of the surroundings and the pride at having achieved such academic standing, combined with the frustration of being held back. It's a beautiful essay. I haven't read it for years. Thanks for writing about it. I think it's time to crack it open again. By the way, you might like The Yellow Wallpaper by Charlotte Perkins Gilman. I'm due for another book..maybe I should try this...always shied away from her..